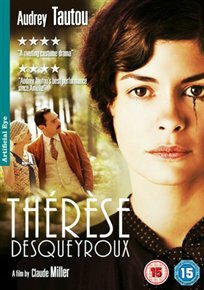 Bourgeois family drama starring Audrey Tautou as the eponymous anti-heroine. Two of the richest families in the Bordeaux area are to be united with the marriage of Therese to nearby land owner Bernard (Gilles Lellouche). Initially Therese looks forward to the future they will share and is hopeful about raising a family with her new husband, but it isn’t long before her happiness turns to restlessness when she learns of his casual anti-semitism and deeply ingrained chauvinism.